A natural wonder, the Hear Reef is a stunning formation of coral in the shape of a heart. 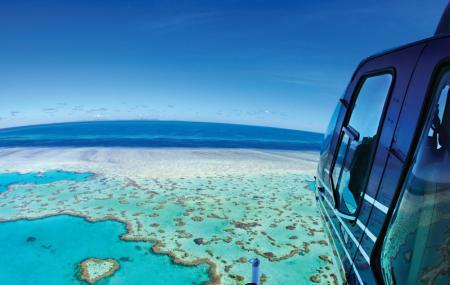 It is one of the most popular tourist attractions in the Great Barrier Reef and Whitsunday Islands. The reef is can be viewed by air only as snorkelling and swimming in the area is prohibited owing to its protected status. Ideal for a romantic flight with a loved one, the heart shape has made this reef a site for numerous proclamations of love and many a wedding proposal. It is a must see when visiting Airlie Beach and has become a symbol of tourism in the Whitsunday region, featuring on several postcards and holiday brochures. Several operators in Airlie Beach conduct helicopter and seaplane tours that take you over Heart Reef giving you an opportunity to gaze upon this beautiful quirk of nature. Look out for whales swimming near buy to add to the experience. How popular is Heart Reef? People normally club together Paddy's Shenanigans Irish Bar And Restaurant and Mama Africa while planning their visit to Heart Reef. People also prefer to start their day with Heart Reef.